Majorca and Minorca, the most exotic places in the Mediterranean Sea. Every year, the archipelago’s beaches attract millions of tourists. Mark Van Strydonck found more than sand-castles: he encountered an extraordinarily rich prehistoric culture. Sanctuaries and lime burials that revealed unique rituals. Bronze bull heads, lead pectorals and sling-stones from warriors in the service of Hannibal. The flourishing Bronze and Iron Age culture of the Balearic Islands has left its traces, from megalithic monuments to in refined jewelry. The most recent finds and scientific developments are made tangible in well-founded comments and more than a hundred original pictures. architecture: the author reveals the secrets behind the sand-castles. An impulse to travel with the mind or to visit the islands in a different way. MARK VAN STRYDONCK is head of the Radiocarbon laboratory at the Royal Institute of Cultural Heritage in Brussels (Belgium). 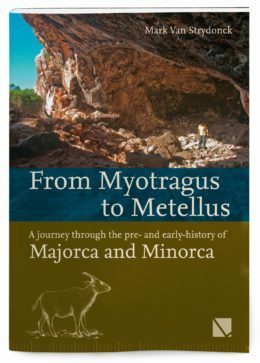 For more than 25 years he has worked together with well-known Spanish, American and English scientific institutes performing archaeological investigations on the Balearic Islands.